Eeny meeny miny moe, which of the 101 islands in Langkawi should we visit? How about spending the day on a private island? Yes please, sign me up! Paradise 101 the island is called. You might be wondering why… well it’s because it is the 101st island in Langkawi and it feels like paradise. Located just off the Telaga Harbour at Pantai Kok in Langkawi, Paradise 101 can be accessed via boat shuttle, which takes just 2 minutes. Owned by adventure company Naam, the island is 2 acres and is surrounded by white sandy beach, tall casuarina and pinoh trees, day-resort facilities, and the beautiful Andaman sea. Paradise 101 is an eco-friendly day-resort island that you can spend the day relaxing, sun baking, swimming, and enjoying water sports. Everyday there’s a full crew of over 15 making sure island is kept clean to ensure your enjoyment. The island itself offers a beautiful backdrop – lush greenery from the main island and the beautiful Andaman sea surrounds, and in the distance, you can catch a glimpse of Langkawi’s cable car. During our visit to the island, we meet our wonderful guide Ezammer, who meets us near the Telaga Harbour to take u on the short boat ride across to Paradise 101. It’s literally a 5 minutes ride across the water. So, no sea sickness excuses, because it is super easy to get to the private island Paradise 101. Looking for a place to stay while in Langkawi? Stay in a living museum at the Bon Ton Resort. Why spend time at the Paradise 101 island? Loved this post? Pin it, it’s more fun! It’s free from crowds. So this means you can take those insta-worthy shots without a crowd of people in the background. Less crowds means more relaxation and rejuvenation, plus a more personalized service from Naam to you. And what sets Paradise 101 apart is that it is private and they do restrict how many guests can be on the island daily. With a dedicated crew on the island, Paradise 101 creates a safe and pleasant environment, which gives you peace of mind when visiting the island. Plus who doesn’t want to say they spent the day on a private island? And if water sport is your kind of thing – Paradise 101 have got you covered here. There is an array of water sport activities that are offered at specially discounted rates for all day pass visitors to the island. It is possible to spend the full day on the island, because the day-resort facilities are enough to keep you busy and feeling comfortable. There is an on-site bar and restaurant, offering a full range of drinks and a snack menu. You will also have access to towels, bottled water, changing room facilities, private cabanas, and the sunset deck with your day pass. If you are keen to get your adrenaline pumping, Paradise 101 offers jet skiing rides off the island. Hop on Naam’s Yamaha Wave Runners and speed around the Andaman Sea…you could even try doing some tricks such as a donut. Paradise 101 offers specially discounted rates on their water sport activities for day pass holders to the island. Want more ideas on things to do in Langkawi that’s off the beaten trek? Here’s our guide to the most unique things to do in Langkawi. Just off the main beach of Paradise 101 is an inflatable aqua park obstacle course called WIBIT. It is a floating playground made up of a series of runways, slides, climbers, and a trampoline. Bring your energy along, because you can easily spend hours working your way through this inflatable obstacle course. Soar across the Andaman Sea on a zip line. The zip line on Paradise 101 is the only one that crosses the Andaman Sea. And when you visit the island, you are entitled to a special discounted rate to hop on the zip line. Searching for places to eat in Langkawi? Check out my guide to some of the best places to eat in Langkawi. For us, after having spent almost a day jet skiing around the islands, we wanted to do something different, so we hopped on the jet pilot. The jet pilot is similar to the donut ride. You sit on a donut shaped inflated tube, which is then towed by a jet ski at a high speed around the water. Its action packed and full of adrenaline. And don’t forget to hold on tight and enjoy the ride! I have to admit – I was screaming my head off, but it was oh so much fun! If you think you’ve run out of water sport activities, think again. Banana boating is another fun water activity that Paradise 101 runs. You sit on an inflatable tube (shaped like a banana, hence the name) and the tube is towed by either a small boat or a jetski. Similar to the jet pilot experience, banana boating can be thrilling especially when the jet ski reaches a high speed. Looking for a unique way to watch the sunset in Langkawi? Enjoy a sunset cruise and dinner in Lankgawi and you’ll get to check an amazing sunset. While there are plenty of shaded spots on the island, there is also a good amount of sunny areas along the white sandy beach. Hop onto one of the beach chairs or lay your towel down on the sand, and enjoy some ‘me’ time sunbaking and taking it easy. There’s a gentle breeze that comes through off the ocean, making it oh-so relaxing. There is nothing more relaxing that laying in a gentle rocking hammock whilst surrounded with fresh air, a lovely ocean breeze, and the sound of nature. Paradise 101 offers a number of hammocks to lie in while relaxing on the beach. It’s the perfect way to relax and rejuvenate. Whether it’s a pina colada, or if you prefer an ice-cold beer, the OMG bar has got you covered. Here you’ll find a full bar at affordable prices. Enjoy your drink at the bar itself, or walk over to any part of the island to enjoy the idyllic scenery that surrounds Paradise 101. I am always on the lookout for special spots to watch the sunset everywhere I go. There are a number of great spots around Langkawi for sunset, but for somewhere more unique and different, Paradise 101 is the spot for you. You can catch the gorgeous Langkawi sunset from the open air sunset deck. Destination events are so totally fun – everyone is in holiday mode, which means guaranteed more fun. So, if you are really looking for a point of difference at your next event, you might want to consider Paradise 101. I mean c’mon…imagine hosting your next event…on a private island! It is possible to book the whole island for your private event, and the Paradise 101 team will work closely with you to help organize it. The best way to get around Langkawi is truly by hiring your own car. There’s minimal public transportation and taxis are limited. It’s quite easy to drive in Langkawi, so if you have your license, I highly recommend hiring a car. And if you do so, you definitely should check out GoCar. GoCar is an on-demand car hire platform, which means that you can hire a car at any time of the day. Whether it’s per hour or per day, GoCar offers flexibility… meaning you only pay for what you use. Currently GoCar is available in over 50 locations across Kuala Lumpur and Langkawi in Malaysia. No compensation was received for this review, however we were guests of Naam Adventure. All opinions remains my own and I only promote products/services that I love. 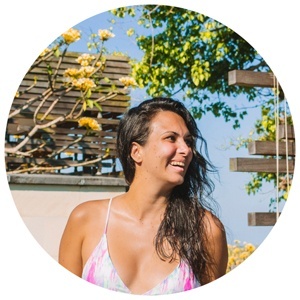 I'm Soraya, travel & food blogger and sunshine chaser at Hello Raya. You know that travel bug? I have been well and truly nipped, infinite times.This is my online nook to share my lifelong experiences of travel & food in hopes to inspire you to explore our beautiful world. Oh wow. I have always wanted to do an inflatable water obstacle course. That looks so cool. Maybe now I just need to do it on Paridise 101. Is that too specific a dream? It’s so much fun! You should totally try it out! Truly it looks that one day on this Island is like a day in Paradise. I like the idea to control the access to island, not only because of the peace we need in order to truly enjoy a place, but even for the environment. Would imagine 10.000 a day going there? The island probably would sink…. Yup, they are all about maintaining the eco-friendly nature of this island, so have strict control over the number of guests visiting. This means it is peaceful and remains beautiful! The idea of a private island sure does sound enticing to me! I traveled to Langkawi a couple of years ago and reading this post made me miss my time there. It was truly a fun few days that I got to spend in Langkawi. I would love to go back again and see what’s new! Wow, spending the day on a private island sounds amazing. And there are so many activities to do there, busy bodies would probably never get bored. I haven’t even heard of some of these activities before but I would definitely do the zip lining and the floating obstacle course. The rest of the time , I ‘d relax in the hammock and on the beach. Wow this does look like paradise! As an island girls born and raised in the Caribbean I’m all about uncrowded blue water beaches. I particularly love sunning myself in hammocks so I’m sure I’d have a blast here! That’s a great way to spend the day! Looks like there is so much to do there. I love visiting islands on our travels, it’s amazing how many there are in the world! I’d probably spend the majority of my time in that hammock if I came here. The Paradise 101 seems like to be a vacation in the vacation! Must be like getting away from heaven to to paradise! All the activities really seems fun especially the floating theme park! My daughter would have a blast! I love the idea of a private island! This is so beautiful, and it looks like there’s really something there for everyone to enjoy. My husband would probably love the adventure part but I would be very happy in that hammock! Oh my god, the Jet Pilot seems awesome!! I had never heard of that before, but I am all up for that now! The place kind of reminded me to a beach I went in Croatia, but it was pretty crowded there, so I loved the idea of not so many tourists around. And the prices are not bad either! Thanks for all the great tips! Vacationing at private island at Paradise 101 in Langkawi must be so fun and exotic. Zipline over Andamans would be so beautiful. Afternoon nap in hammock in exotic surrounding would be the best nap. You have taken beautiful pictures. How cool is this place!!! I I have never been on a private island before. And Paradise 101 looks so inviting. I would love to try the Jet Pilot. Sounds like so much fun. And who doesn’t like to nap in a hammock. Paradise 101 , here we come. Langkawi sounds so much fun! I always wanted to do that jet pilot ride, but doing it in Canada always seems futile – feel like it’s something that needs to be done in tropical waters under the sun. And the fact that it’s a private island is enough to entice me to visit! Paradise 101 looks amazing ! I would love to go to this kind of a private island and spend the day there relaxing or doing some water activities. Maybe I missed it in your post but I am wondering if one can stay overnight on this island or not ? Can you just go there for the day and have to take the boat back at night ? Wow, the island is definitely a little paradise for people who want to spend time in non crowded places. The azure blue beach and the lush greenery is such a pleasure to look at. What a great way to spend a day in the island, sunbathing, water sports and cocktails by the beach, one couldn’t ask fpr more on a vacation.